I would like to give a warm welcome to Marianne Petit a guest with Critters on Tour. She’s here today to showcase Behind the Mask. In 1940 Paris, both rich and poor are thrust together – a mixed society struggling to survive. I am married for thirty-nine years. I have two sons and four grandchildren ages ten through seventeen months. I live on Long Island NY. Question: Tell us your latest news. I just finished my second romantic time travel that goes back to the California Gold Rush of 1850. The title is Timeless River and with any luck, it will be available in January. Question: When and why did you begin writing? I started writing in high school after I read numerous romance novels and thought, how hard can it be. Well, it’s a lot harder to write and finish a book than I thought! I heard about a PBS documentary about the Battle of the Little Bighorn and started plotting away. Questions: How did you come up with your titles? For my first book, A Find Through Time, my heroine finds a skull and then is sent back in time. I always seem to have some sort of reference to my title in the plot. In my latest book the heroine refers to her timeless river. In my second book, there’s a ghost, in my third book they are looking for the amulet of darkness and in my fourth book everyone is hiding behind a mask. Question: Do you have a specific writing style? Is there anything about your style or genre that you find particularly challenging? No style. I think as the years go by, you learn, grow, and the writing changes. I find writing a mystery challenging. Question: How much of the book is realistic and are experiences based on someone you know, or events in your own life? 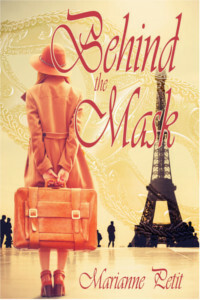 Behind the Mask, my fourth romance book, is based on family and friends who lived in France during WWII. All my other books are purely fictional. Question: To craft your works, do you have to travel? Before or during the process? Before my second book, Rebecca’s Ghost I traveled to Williamsburg, VA to get a sense of the buildings and a feel for the time-period. My third book, Amulet of Darkness is a fantasy world based on Greek and Roman mythology, so unless I time traveled, LOL, no. Question: Who designed the covers? Two of my books were done by illustrators, the other ones I designed. Question: Is there a message in your novel that you want readers to grasp? In A Find Through Time I basically wrote about the plight of the Native Americans and how they struggled due to circumstances beyond their control. In Amulet of Darkness, there are undertones of religious belief. Behind the Mask’s message would be how hard war is and let’s not forget all the heroes who fought for their beliefs and who put their lives in danger saving others. Rebecca’s Ghost is all about family. In my new book, Timeless River, another time travel that will be out in the fall, my message is to love yourself and to stand up for your dreams. Sometimes what you wish for isn’t all it’s cracked up to be. Question: Are there any new authors that have grasped your interest? Who is your favorite writer, and what is it about their work that really strikes you? Wow, that’s hard to say as I have read so many great authors. I am partial to my old critique partner Mira Platt. I love her style of writing. Question: Outside of family members, name one entity that supported your commitment to become a published author. My husband is my biggest supporter…. technically, he’s not a family member so I hope that counts. Question: Do you see writing as a career? I see writing as a part of my life I couldn’t do without. Question: Did you learn anything during the writing of your recent book? I learned never to toss an unfinished story because it’s not working. Put it away, pick it up at a later date, look at in a different light and start all over again if you have to. My last book was started years ago and like a string of pearls it was broken. When I was deciding what to write next, I picked it up, made some adjustments, looked at it from different angles and now it’s finished and much better than the first time I started writing it. Question: If your book was made into a film, who would you like to play the lead? Well, I don’t know many Native American actors, but I would definitely insist on one for A Find Through Time. For Rebecca’s Ghost, I’d love to see Pierce Bronson as the dark brooding hero. For Amulet of Darkness, a nice muscled man like Chris Hemsworth would be awesome. For Behind the Mask, Tom Cruise and for Timeless River…Liam Hemsworth. Question: Any advice for other writers? If you love writing don’t give up no matter the criticism, rejections and frustration. Finishing your manuscript, holding your book in your hand never gets tiring and is a thrill that makes everything you went through to get to that point worthwhile. Question: Anything specific you want to tell your readers? Well, yes. If you like a book, please take the time to let the author know. Getting a nice email from someone who enjoyed your work can make all the difference in an author’s day. And please, please take the time to write a review, even a short one on Amazon. With so many author’s books, out on the internet a review is the only way to get an author recognized. Question: Is there one person, past or present, you would love to meet? Why? I would love to meet Angelina Jolie because we both do a lot of charity work. I love to oil paint, sing with my choir, horseback ride, kayak and go white water rafting. Question: What TV shows/films do you enjoy watching? Outlander and Poldark are my favorite shows. Question: Favorite foods, colors, music? Question: Imagine a future where you no longer write. What would you do? I’d be at my easel painting. Question: You only have 24 hours to live, how would you spend that time? With my family having fun. I’d probably take them all on a trip together. Question: Do you have a blog or website readers can visit for updates, events and special offers?